Luxury Camping at Château Le Brevedent Campsite. 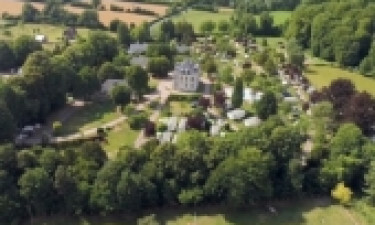 Château Le Brevedent luxury camping site is conveniently located in Pont L'Evêque, Normandy. Dwarfed by rich and ripe orchards and encompassing a beautiful lake, this heavenly hideaway is sure to please. At its centre lies a grand château and the site bares close proximity to some sandy beaches, meaning you can truly enjoy the best that France has to offer. To make your enquiries about bungalow tent and mobile home accommodation, get in touch with LUX-camp today. Welcome to Château Le Brevedent Campsite. 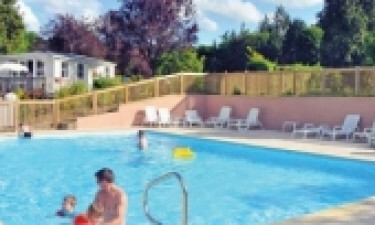 What's so good about Château Le Brevedent camping holiday? A great base from which you can explore this renowned cider country. Twin aspect of pool complex and lake. Resident Kids club and playing areas. After a long lie-in at your luxury bungalow or mobile home, you'll want to get busy in this well organized parc. Château Le Brevedent has a multi-level water park overlooked by the grand château. There are two outdoor, heated pools; one for kids and one for the family complete with water jets to massage those achy limbs. The terrace is home to lots of sun loungers so you can soak up the sun's rays in ultimate comfort. The surrounding trees and lush landscape will enhance that peaceful atmosphere. 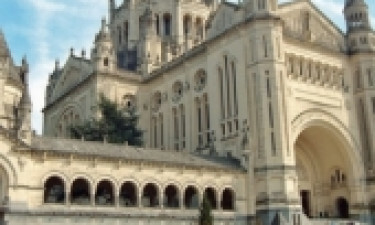 Why not pack a picnic and take the family for a day out at the capital of the Pays d’Augearea; lovely Lisieux. It's steeped in history and the grand architecture reflects typical French heritage and tradition. Although it was almost brought to ruin during the war, the town has still managed to retain a 12th century cathedral plus a 15th century Saint Germain de Livet castle. The museum of art & history has a fine display of Roman art and artefacts. Château Le Brevedent offers a wide range of activities like tennis, table tennis, boules, volleyball, badminton and football. Try out your angling skills at the local lake, or try your hand at some crazy golf. Bikes are available for rent and are the perfect way to explore the surrounding towns and tourist hotspots. Further afield you can try some quad biking, golf or horse riding. You can also organize boats trips. Château Le Brevedent has a small grocery store on site which is well stocked with family favourites. Stock up on coffee, fresh bread and pastries, fruit, vegetables and other camping sundries. Make sure to sample some of the local wines and beers. This luxury camping experience offers all you could need by way of food and beverages. The resident restaurant, Les Trois Sibylles, provides indoor and terraced seating, not to mention the fact there's a take-away if you fancy something more simple, as well as an onsite bar. There's also a pizzeria and a quaint little cafeteria where you can enjoy a latte.